Originally alloy 600 was used during the aluminide coating operation of one gas turbine component supplier. Exposed to extreme temperatures of over 1093.3°C distortion is a common problem and alloy 600 was used to reinforce channels on the exterior of the hot section. Despite the reinforcements considerable maintenance was still required. The development of RA 602 CA® alloy enabled the company to upgrade their material of construction. Designed specifically for extreme temperature use, RA 602 CA® has improved creep strength and oxidation resistance. A trial run was setup which used three RA 602 CA® channels and two alloy 600 channels fabricated from ¼” plate. The testing ran for several months until the alloy 600 channels needed to be repaired. Close inspections revealed the RA 602 CA® channels to be in almost new condition, with very little distortion, whilst the alloy 600 channels were massively distorted and required replacement. All alloy 600 retorts were replaced by high quality RA 602 CA® alloy retorts. Following the success of the RA 602 CA® retorts the alloy has been used for other fixtures in the coating process. Thanks to the high strength of RA 602 CA® the need for external reinforcement is no more. Therefore fabrication has been simplified and the weight of the components has been reduced some 30%. 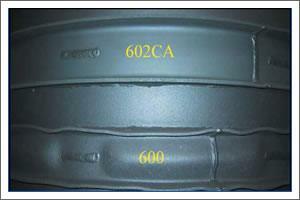 RA 602 CA® has also reduced scaling of the retort. As a leading supplier of alloys we stock RA 602 CA® in a number of forms including plate, sheet, round bar and welding consumables. For more information on the alloys we supply or if you’d like to buy RA 602 CA® then don’t hesitate to get in touch.